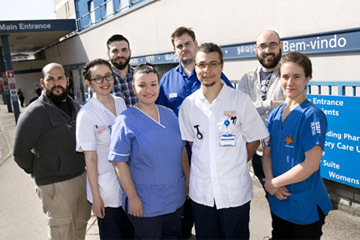 West Hertfordshire Hospitals NHS Trust is encouraging staff from countries within the European Union (EU) to apply for the government’s EU Settlement Scheme at the earliest opportunity. The scheme, which enables EU citizens to apply for 'settled' or 'pre-settled' status in order to continue living in the UK after 30 June 2021, has been re-opened for healthcare sector workers until 30 March 2019 following a successful pilot. It will then be open to the wider UK population. Earlier this week, the Prime Minister announced that from 30 March 2019, there will be no application fee when applying for ‘settled’ or ‘pre-settled’ status. Anyone who applies before 30 March, including those who applied during the pilot in December, will have their full application fee refunded by the Home Office. The trust employs over 530 members of staff who are EU citizens. They make up 11% of our workforce and all contribute their skills and expertise as nurses, midwives, doctors and allied health professionals. They also provide valuable support in non-clinical areas too. Director of HR Paul da Gama said: "It's great news that the EU settlement scheme has been reopened for healthcare sector workers and that there is no longer a fee for EU citizens when applying for ‘settled’ or ‘pre-settled’ status. We are lucky to have such a diverse workforce made up of staff from so many countries, who all bring with them a wide range of skills, knowledge and experience, and we encourage all our EU staff to apply at the earliest opportunity."